The Boston Red Sox secured a fourth World Series crown in 15 seasons with a win over the Los Angeles Dodgers on Sunday. 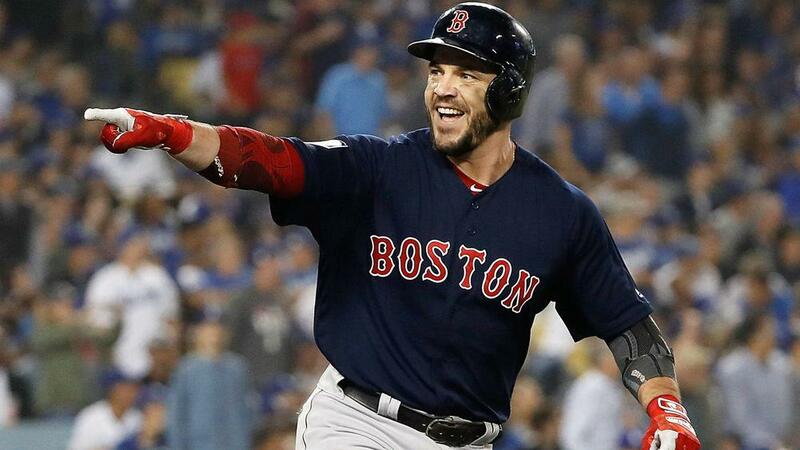 The Red Sox beat the Dodgers 5-1 in game five behind great performances from David Price on the mound and unheralded veteran Steve Pearce at the plate to clinch the series 4-1. Since ending an 86-year World Series title drought in 2004, Boston have now won four of the past 15 championships. It was no surprise a team that had 108 regular-season wins claimed the series, but Boston prevailed in part because some unexpected players stepped up in key moments. Pearce came into the series a .257 career hitter, with 90 home runs in 12 MLB seasons. But the veteran first baseman hit the game-tying home run in game four, and put the Red Sox on the scoreboard with another home run in the first inning of game five. Then, he homered again in the eighth for a critical insurance run. While you expect to get beaten by guys like Mookie Betts and J.D. Martinez (who both also homered in game five), perhaps not by a 35-year-old journeyman. But Pearce was not the only unexpected hero for Boston in the postseason. Pinch-hitter Mitch Moreland stunned the Dodgers with a three-run home run in the seventh that started Boston's comeback in game four. Reliever Joe Kelly (4.39 ERA in regular season) pitched in all five games, going six scoreless innings, with 10 strikeouts. And of course, no-one could have foreseen Jackie Bradley Jr. winning the American League Championship Series (ALCS) MVP. While stars like Betts, Martinez and ace Chris Sale dominated headlines throughout the regular season, the Red Sox got some critical contributions throughout the roster during the postseason. This is why the Red Sox gave Price that eye-popping, seven-year, $217million deal in late 2015. The veteran lefty has had his struggles in Boston, but he was good this season, and fantastic in the World Series. He went seven innings in game five, yielding only one run and three hits. He also won game two, and he pitched out of the bullpen in the marathon game three. For the series, he pitched 13.2 innings, giving up three runs. Price is not the only high-profile Red Sox pitching acquisition who came up big in the regular season or postseason. Sale, acquired from the Chicago White Sox via trade in 2016 and Nathan Eovaldi (acquired before the trade deadline this season) were also big, as was closer Craig Kimbrel, who came over from San Diego after the 2015 season. It would be easy to look back at the five-game series and blame specific Dodgers for coming up short (Manny Machado hit a very quiet .182 in the series). You could pick a moment or two here and there, or a starting lineup decision, that might have cost the Dodgers a victory (see Dave Roberts' decision to replace a dominant Rich Hill in game four). But the Dodgers did not lose this series through their own mistakes. They simply got beaten by a better team. The Red Sox won 108 games this season, 16 more than LA. The Dodgers were a preseason favourite to return to the World Series, but injuries to key players hampered the team much of the year. LA were third in the National League West, only six games over .500, on August 22. The Dodgers did well to come on strong down the stretch, win the NL West and beat a tough Milwaukee Brewers club in the National League Championship Series. But their magic ran out in this series. They simply ran into a better team.